Introducing “Wear Red for Public Ed! Every Wednesday we will ask every PJSTA member to wear red to work in some form. Red short sleeved and long sleeved PJSTA tee-shirts will be available as an option, but any red will do. Hopefully you will be asked why you are wearing red. You can say that you are wearing red because you stand in support of public education and against top down, corporate reforms that have been imposed on us. You can then give them a copy of our flyer (see bottom of this post). On Wednesday we will ask you to use the hashtag #red4ed on social media to share why you wear red. Tweet it, set it as your Facebook status, take pictures of your colleagues in their red and post to Instagram. We anticipate other groups joining this cause and we are hoping to get #red4ed trending on Twitter every Wednesday! A great example could be “I wear #red4ed today because I care about my students!” or “I wear #red4ed today because I stand against high stakes testing!” Be creative and have fun with it! Once again, we will be starting on Wednesday, October 2nd! 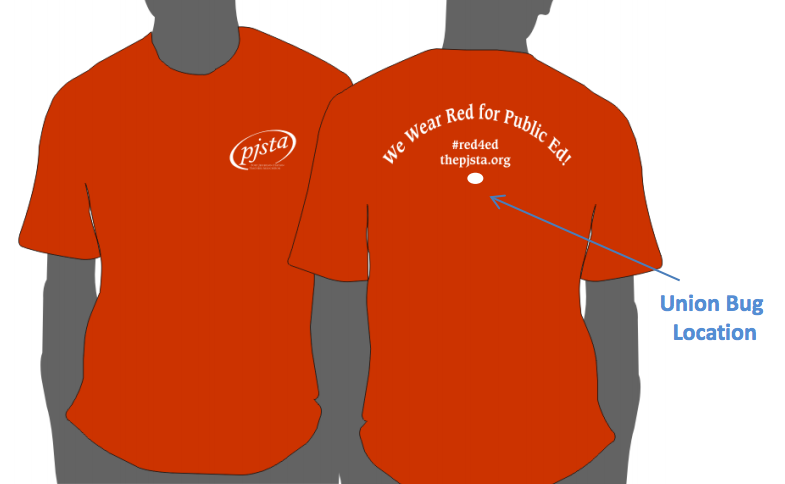 If you would like to order one of the red PJSTA shirts please email Beth Shapiro at bethshapiro1@gmail.com. Be sure to specify short sleeve (50/50) or long sleeve (100% cotton), along with your name, your shirt size, and what building you work in. Feel free to use the comment section below for any questions. This entry was posted in General and tagged #red4ed, PJSTA, Public Ed. Bookmark the permalink. 1 Response to Introducing “Wear Red for Public Ed!